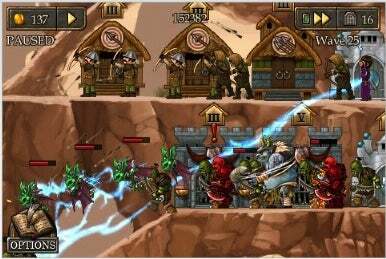 Chillingo and Gimka Entertainment on Wednesday announced the release of Defender Chronicles — a new side-view tower defense game for the iPhone and iPod touch. It costs $3 as an introductory price, and will go up to $5 after the first week. Defender Chronicles is a side-view-based take on the popular tower defense genre. Defender Chronicles combines role-playing adventure game and tower defense elements. You must protect the kingdom of Athelia from an attack by an army of orcs and the undead, installing berserkers, rangers, halfings, mages, warriors and archers along streets and paths to repel the invaders. You’ll also have to face off against massive boss monsters including ogres and golems. The game features five hand-drawn battlegrounds featuring a side-view perspective that lets you zoom in on the action. You have six different defense factions, each with their own unique abilities. Defender Chronicles includes five game modes — campaign, freestyle, extended classic and classic extended. The game also features seven original music soundtracks, spatial sound effects and voice-acting. System requirements all for iPhone OS 2.2 or later.